Anthony Allen and Michelle Stronz, the founders of A Tipping Point (ATP), at Monday night’s meeting. A new not-for-profit committed to economic development with a social impact is looking to convert a vacant industrial building near the Mill River into the new home for a brewery, a coffee roaster and an indoor mushroom farm. On Monday night in the John S. Martinez school’s library, local entrepreneurs Anthony Allen and Michelle Stronz held a community meeting about the plan, called A Tipping Point (ATP). They offered vision for how to create sustainable, environmentally-conscious economic development that directly benefits the neighborhoods in which that development takes place. Thirty people came out to show their support and learn about the new project. Allen, a social entrepreneur from East Rock, and Stronz, Allen’s former business school professor at Quinnipiac University, are planning on bringing three new businesses into a 25,000 square-foot former plate-glass factory at 20 Mill St. in the next few years. City transit chief Doug Hausladen (right) and city engineer Giovanni zinn (left). A developer is just about ready to put shovels in the ground to start construction on 269 new market-rate apartments that will replace a four-acre surface parking lot on a “super block” at Audubon and Orange — and to help the city add a traffic-calming “speed table” there. Matthew Edvardsen of South Nowarlk-based Spinnaker Real Estate Partners offered that update at Tuesday night’s monthly meeting of the Downtown-Wooster Square Community Management Team (DWSCMT) on the second floor of City Hall. Edvardsen told neighbors that his firm should have all necessary building permits, construction funding and subcontractor agreements in place by the end of the year for the new “Audubon Square” mixed-use development. The old Lehman Brothers Inc. printing company, which has been empty for almost 10 years. 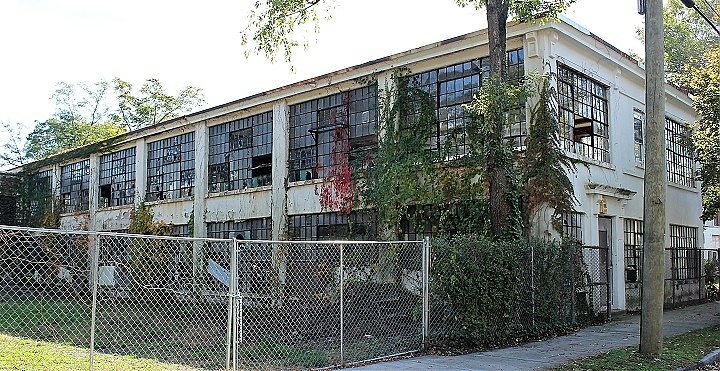 With a plan to renovate a shuttered Goatville factory printing plant, a fast-growing New Haven real estate company is betting that New Haven’s housing boom is ready for condominiums, not just high-end rental apartments. The testing ground for this condo experiment will be the former Lehman Brothers printing plant at Foster and Canner streets, which has been closed and derelict for almost a decade. During Monday night’s East Rock Community Management Team meeting at the mActivity Gym on Nicoll Street, property manager Mendy Paris, architect Wayne Garrick, and lawyer Kenneth Rozich of the company Ocean Management presented their prospective plan for converting the building into a 30-unit condominium complex. New Haven is awash in new high-end housing construction, but other developers report they have been able to obtain financing only for rentals, not condos. Ocean gets private financing from out-of-state investors and doesn’t need to rely on banks. Friday, October 20, 2017 - Wooster Square will soon be home to two public ping pong tables after neighbors voted in a spirited election to spend part of their annual citizen-controlled allotment of the city budget on tabletop tennis. Such was the result of the most recent Downtown-Wooster Square Community Management Team (DWSCMT) meeting, which was held on the second floor of City Hall. The meeting featured a “ranked choice”-style election — not over personalities seeking public office, but rather over how a community should allot public money. Advocates for public bikes and a kiosk and a piano competed with the ping pong proponent for the public’s support. Chair Florita Gillespie: Tonight we’re voting for this. Wednesday, October 4, 2017 - The city’s Redevelopment Agency won hard-earned community support on Tuesday night for its bid to use eminent domain to hold slumlords accountable in the Dwight neighborhood. City officials offered one final concession to the neighborhood: The city won’t follow through with seizing a specific rundown property If the community vetoes the idea. Such was the outcome of the latest meeting of the Dwight Community Management Team (DCMT) on Tuesday night, when over 30 neighbors gathered in the cafeteria of the Amistad Academy Middle School on Edgewood Avenue to discuss new developments in the neighborhood. On the table was whether to approve a Chapel/Dwight/Whalley Redevelopment and Renewal Plan proposed by the city’s Redevelopment Agency. The agency has tried for months to win the team’s approval, stop one in a multi-step process of making the plan a realty. The Downtown-Wooster Square Community Management Team. Thursday, September 21, 2017 - The new owners of the the 123-year-old Hotel Duncan promised to preserve many of its historic architectural elements, from its manual-operated elevator to its neon-lit marquee, as it converts the building into an upscale establishment. On the inside, they aim to reimagine the design of the rooms and lobbies to reflect New Haven history and culture and to create a communal space that is welcoming to both visiting hotel guests and members of the community. Such was the pitch that Graduate Hotels president Tim Franzen made to the Downtown-Wooster Square Community Management Team on Tuesday night during its monthly meeting on the second floor of City Hall.